Don't let the cold weather stop you from enjoying your ride. 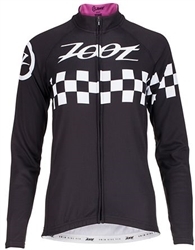 The new women's Cycle Cali Thermo Long Sleeve Jersey will keep you covered in the colder weather. The comfortable fabric ensures superior warmth and moisture management. Back pockets allow you to store your nutrition on outside of the jacket. Get outside and ride.